Very easy to use, yet versatile stationary sprinkler for all your small garden needs. Simply rotate the anatomic upper part to select one of the 6 available jets. Ready for immediate use, it guarantees uniform and gentle irrigation, without puddles, and with jets that create pleasant water games. Made entirely from ABS. 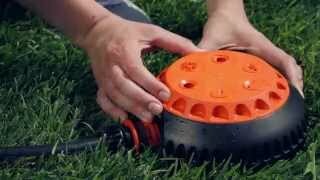 Special round shape allows easy dragging over lawns, between flower beds and plants. Shaped upper section for easily lifting. Flange rotates to provide 6 different functions. Pieces per pallet: 135 pcs.